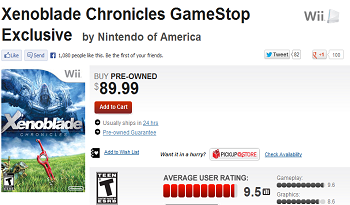 GameStop wants $89.99 for for rare used copies of Xenoblade Chronicles. While many might knock the used games bin (not without reason), it serves as the gatekeeper to the rare joy of discovering an unexpected gem. Take Xenoblade Chronicles, for instance. One of the best regarded titles on the Wii, it's also one of the rarest thanks to its extremely limited distribution. Sure, you can always buy a copy online, but doing so is going to set you back quite a bit. If you happened to find a copy, you might as well consider it Christmas because Santa Clause himself won't be able bring you a better gift. It's recently been revealed however, that GameStop, apparently having an unsold used stock of the title, has been putting Xenoblade Chronicles back onto shelves. The unexpected resurgence of a rare game is, generally, a good development. That said, GameStop, apparently catching wind of the fact that gamers will pay a lot for it, has decided to get in on the gouging, raising prices on the title to $89.99. When asked to comment on the increase, GameStop stated that the price was "based on current market value." What makes this price sting for some is the fact that Xenoblade Chronicles was sold exclusively through GameStop and Nintendo's online store. Once Nintendo ran out, GameStop was literally the only place in town that was going to have a copy. In other words, GameStop had a lot of power to influence the market for this particular title. Hanging onto these copies, a move that arguably may have driven up the "current market value", smacks suspiciously of the retailer waiting for prices to rise so it could then sell them off its supply at a premium. Making this even more suspicious is anecdotal evidence from purchasers that suggests many of these "used" copies are, in fact, new. Some customers, having bought a used copy, have reported that the game's Club Nintendo codes are still fresh. This isn't, by any means, conclusive evidence, but some believe that GameStop may have simply been holding onto a stock of new copies that it then reprinted as used so it could raise prices. At the end of the day, of course, GameStop is a business and can do what it pleases with its product. That said, actions like these probably aren't going to do much to win over consumers who, by and large, are becoming more inclined to purchase games digitally.